Forget-Me-Not Animal Rescue will be at the first Chester Vegan Festival which is on Sunday 20th August 2017 from 10.30am to 5pm. The place - QUEEN HOTEL and THE CARRIAGE SHED, both immediately opposite and next to Chester Railway Station. 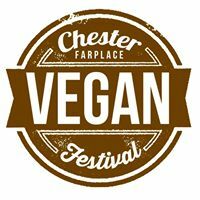 Advance tickets with priority entry can be bought at www.chesterveganfestival.com/the-show/ for just £3. Under 16s are free. We also have a limited number of VIP tickets with early entry at 10am and a goodie bag of delights in an unbleached cotton FARPLACE VEGAN FESTIVALS bag also available for £15 each at the link. Forget-Me-Not Animal Rescue needs constant financial support to continue their vital work helping animals, so please support us by making a donation today. Forget-Me-Not Animal Rescue is in memory of all those animals we have been so fortunate to share our lives with and to those we have never met but have suffered and died in their millions. Help raise funds for Forget-Me-Not Animal Rescue when you shop online at Shop Vegan. Click here to find out how.